March 24, 2013. Strong. Strong. Strong. Stay strong and powerful even if it’s only in your mind. If your body is giving out with all these Lyme symptoms and Lyme disease, stay strong with your mind. I know how you feel, there were days when I felt like I could not go on… but then somehow I white knuckled it and made it through another minute, another hour… another day. 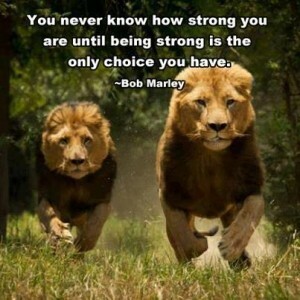 Go forward as the lion and you will be amazed at how strong you are. Keep fighting it’s the only choice you have. 100% Recovery BeRelentless! Be Strong against lyme symptoms and lyme disease!